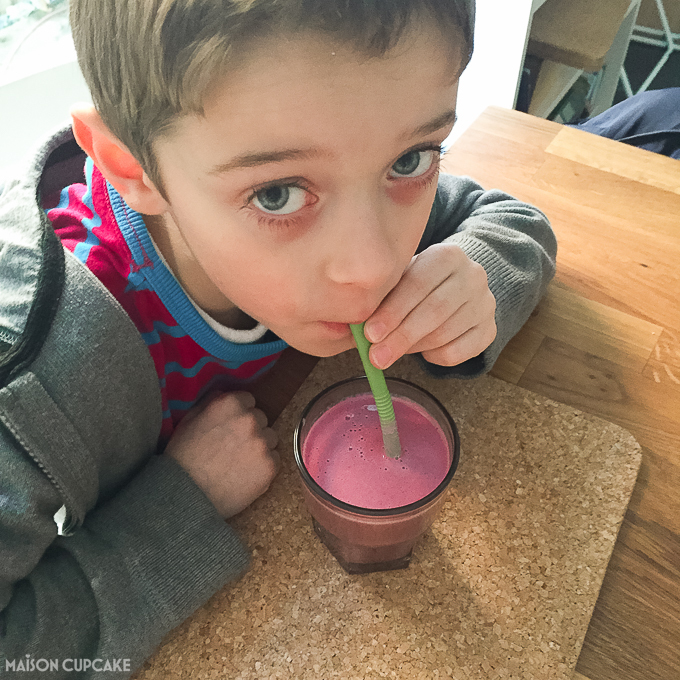 This raspberry smoothie with red cabbage is great for getting children to eat more vegetables. It’s totally pinkalicious! Eyebrows have been raised when I’ve said I’m making fruit smoothies with red cabbage. But honestly, look at this colour, deepened and sweetened with raspberries from our garden. Who could say no? Well, probably my seven year old would have done had he known what was lurking in his raspberry smoothie. But the beauty of power blenders is you can get away with this kind of thing so long as it looks nice and tastes good. He has NO idea. Bad mommy. Place the ingredients into the power blender jug. Replace the lid and blend for around 45 seconds until completely smooth. It's that easy. 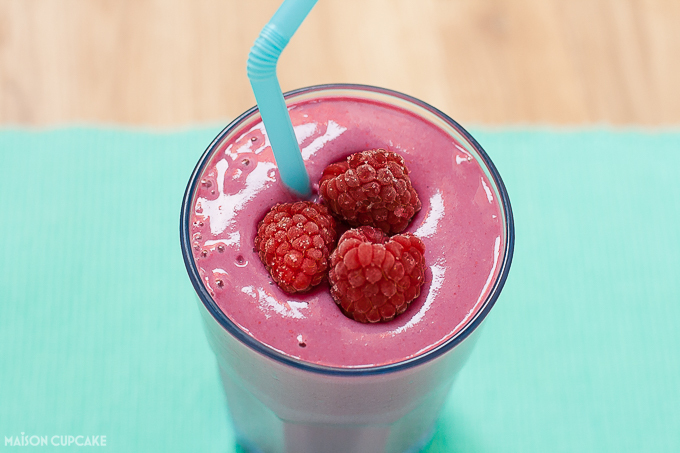 This raspberry smoothie with red cabbage heralds the June edition of Breakfast Club. Breakfast Club is the blogging event originally started by Helen of Fuss Free Flavours but now organised by myself and Andrea at Made With Pink. Breakfast should set you up for the day and we think too few people make the most of their breakfast. We want to celebrate the variety of things people can eat for breakfast. You may enter up to two dishes per month. We don’t mind dishes being entered to other events but the post must be newly published material within the current month i.e. June 2015. 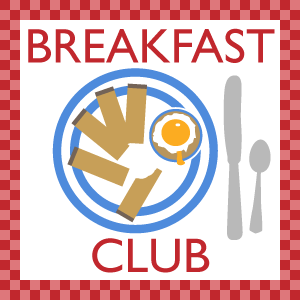 All entrants participating in Breakfast Club are offered an invite to pin to the Breakfast Club Pinterest Board. Please message Sarah for an invite. Also this month United Cakedom is hosting the “Pastry Challenge” with a breakfast theme so you could enter both events if your entry is a pastry breakfast item. Please publish your new post linking to this post and the co-host (which this month is Andrea Made With Pink). If you @mention either of us on Twitter with #BlogBreakfastClub hashtag, Andrea and Sarah will try to RT as many entries as they can. I love this idea of adding red cabbage to a smoothie instead of the more common choice of kale or spinach, genius.. Ted looks pretty happy with it as well. this is super Sarah. I don’t use red cabbage much but will have to get some to include it in my smoothies. Am getting better at making my smoothies more veggie focused! I often buy red cabbage to make home made coleslaw but it can take a while to get through it. So it’s great to bung a chunk into a smoothie! I love this!!!! I’m going to try it with the kids. Great idea. Thanks Kate, I hope they love it! I would drink this for the colour alone. You do make food and drinks that are all my favourite colours. You do hot colours very well and as long as I don’t taste the red cabbage in this I would love it! Thanks Laura – I can assure you the red cabbage hides behind the raspberry very well! What a great color, great consistency and you got some veggies in and no one knows it! I know… the cat is out the bag now though eh?! Oops you are right, thanks for spotting!! 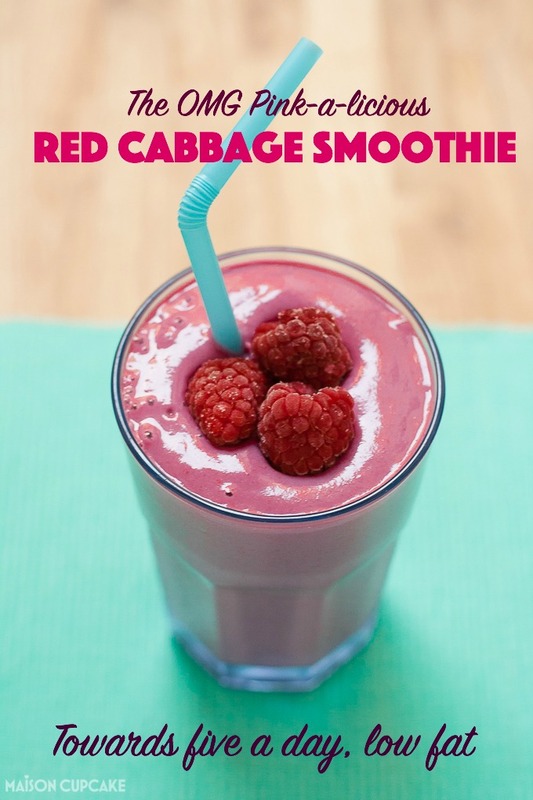 Looks fantastic and I never would have thought of putting cabbage in a sweet smoothie! It’s a great way to hide some veggies! Gosh, who knew red cabbage works in a smoothie? I’ll definitely be trying this. Welcome back Breakfast Club! What a great idea! Love the sneaky-factor, but it’s all good, right?! Nice! It’s got to be good! I did exactly what you said I raised my eyebrow at the idea of red cabbage in a smoothie. Seems like an odd ingredient, but would definitely be interested in trying it! Smoothies are such a great way to get fruit and veggies in everyday for us adults too! I know I don’t eat enough!! Well yes and you really can’t taste the red cabbage against the raspberry. Thanks very much, I think a bright pink drink is a good way to start the day! Who would have thunk, but it looks very good!! I’ve seen Vitamix demos with white cabbage added to berry smoothies so this seemed a no brainer to me! Seriously brilliant idea that I need to borrow sarah. Hi Sarah, your pink smoothie looks fantastic, I would never have guessed about the red cabbage if you hadn’t of said, that’s inspired. I’ve linked up for the first time ever, hope you like the recipe. Your smoothie looks amazing, I love the idea of adding red cabbage in there! I would love to see you link up this recipe at our gluten free fridays party over at vegetarianmamma.com Each Friday we have bloggers share their favorite GF recipes. I know the readers would like this one! Has anyone used strawberries in this rather than raspberries? I’m not a fan of the seeds in raspberries and I always have strawberries around needing to be eaten… Also would frozen fruit work as well? Hi Pam, my raspberries were frozen in this. You could make it with strawberries and although strawberries are not generally recommended for freezing, if you were going to blend them in a smoothie I don’t see why you couldn’t.